The following is a translation of a statement by the Parti de Gauche in which they announce their support for BDS During his visit to Israel, François Hollande declared before the most prominent Israeli political representatives: “Till today, you have never yielded when it comes to democracy, diversity, and human rights”. One must bear in mind that the State of Israel has consistently defied international law. One must bear in mind that the State of Israel has consistently defied international law. Even now, the Gaza Strip is under an illegal blockade and is an open-air prison for its 1.5 million inhabitants. Israel continues to detain thousands of Palestinian political prisoners, and the recent release of 26 of them has changed nothing: following their release, four more Palestinians were killed by the Israeli army. The Prawer plan, designed to judaize the Negev, continues in conniving the forced transfer of almost 70,000 Palestinian Bedouins - citizens of Israel - into reserves. The colonisation of the West Bank is being pursued unrelentingly: even while the US Secretary of State John Kerry – visibly embarrassed by the conduct of the Israeli government - was visiting the country, the Israeli authorities announced new authorisations to build 5,000 more homes in East Jerusalem and the West Bank. And the Israeli government has no intention of respecting the borders of a hypothetical Palestinian State. It has openly declared that it will maintain a military presence in the Jordan Valley, together with its planned “security barrier” between the West Bank and Jordan, which will be built once the barrier between Israel and the Egyptian Sinai is completed. After its vote at the United Nations General Assembly in favour of Palestine as an Observer Member, France must bilaterally recognise the State of Palestine. It is high time to move forward to go from speeches and declarations to action. This can only be done by imposing real sanctions on the Israeli government in order to force it to respect the dozens of UN resolutions relating to Israel. The Left Party calls upon François Hollande to demand of Benjamin Netanyahu's government that it free all the Palestinian political prisoners, freeze and dismantle the colonies, lift the siege of Gaza, and recognise the State of Palestine within the 1967 borders. It calls upon the citizens of France to act in favour of the rights of all the Palestinians: their right to live in a viable and fully sovereign State within the 1967 borders, as well as the right to equality for all the citizens of Israel. In view of the Israeli government's reinforced oppression of the Palestinians, at the 16th November meeting of the National Bureau, the Left Party decided to lend its support to the various campaigns for Boycott Divestment, Sanctions waged by BDS France. 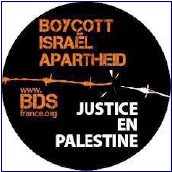 We can all join in this action, notably by boycotting Israeli products, by demanding that French firms not participate in Israel's policies of colonisation and apartheid, and by asking the President and government of France to apply real sanctions on Israel. Peace can only be achieved by obliging Israel to respect the Palestinians and their universal rights.